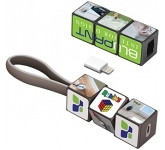 Most modern offices are packed with promotional items. Some of those products are so basic that people don't even pay attention to them. So, if you are in need of an original giveaway, and one which will both stand out and be highly practical, you should think carefully before you make your pick. Nowadays, everyone is of the opinion that they have seen it all; and, in many cases, they are not wrong. Therefore, your promotional products need to stand out from the crowd. You need to bring something new to the table; something that will spark people's interest. 1. Charging cables are fun, new and highly practical! What does every modern business person use? Computers, smartphones, tablets, and so on. And what do all of these gadgets have in common? They need to be charged on a regular basis. 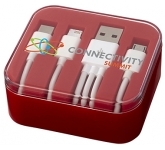 That's what makes logo printed charging cables perfect company giveaways. Plus, people are so busy and constantly in a hurry that they tend to forget their chargers. Luckily, that's a great marketing opportunity for you! Put a set of charging cables on their desks and give them a solution to the problem they didn't even know they had. Also, subtly add your logo to the cables and you will have made your way in. It's that easy! 2. 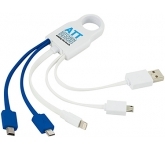 Promotional charging cables for everyone! While receiving gifts always feel great, not all gifts are the same. An expensive but impractical gift won't get you any results. 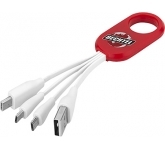 On the other hand, a useful gadget such as a set corporate branded charging cables is bound to make the most of your marketing strategy. 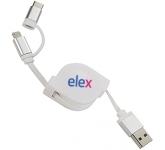 Promotional charging cables also come at a great price which means you won't have to break your budget, which is always great to hear. An effective solution doesn't have to come with a hefty price tag! In addition to being extremely useful, charging cables can look pretty good, too, which is always a bonus. 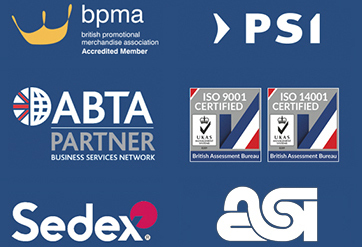 You can select from a huge range of exciting options to ensure that your logo and message always remain at the forefront of your customers minds. Hand them out at trade shows, conferences, product launches, exhibitions, etc., and just sit back and wait for your business to start growing! 4. Our price match guarantee! We continually check our prices daily against all the leading UK suppliers to ensure that you are receiving the very best possible prices. 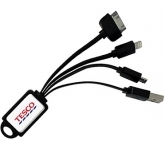 So if you are looking for printed charging cables and find the same product cheaper, just let us know and we will match the price and back it with our industry Award Winning Customer Service - that's our guarantee! !